Who hasn’t looked at their phone or computer camera and wondered if someone was remotely watching you? What about those emails to your mom or therapist, how secure are they? In this ever-changing digital landscape, you can never be too safe with your digital footprint. 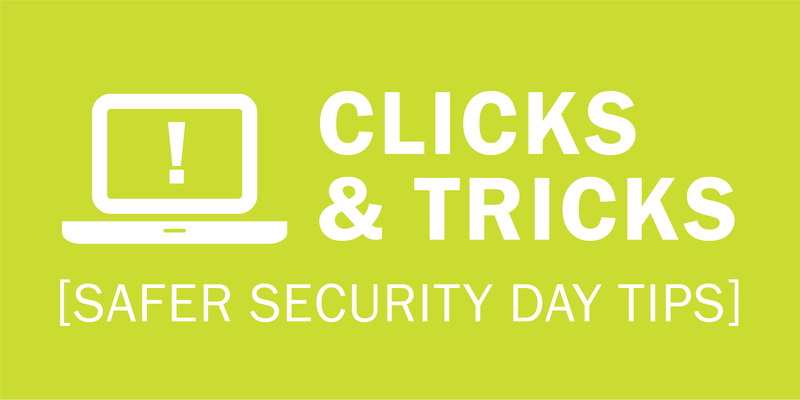 So in honor of National Safer Internet Day, we thought we’d share a few tricks of the trade! Photo Sharing: Between snapping that selfie and adjusting the filter, take some time to examine the background for details. You may have inadvertently caught a license plate or a portion of your address; or location detail in general that you might not want to advertise. There are many photo apps available that will assist in blurring out the background details you might not want to share. Online Purchasing: The world is at our fingertips with a click of a “Buy Now” button, and the ease of purchase has certainly muted some of our initial caution with online shopping. There are some easy ways to ensure you are secure in your purchasing – namely utilizing secure sites with a secure connection. It is tempting to hook into Wi-Fi wherever available, however, some of those open networks do not offer the kind of protection you might want for your banking information – wait until you get home! Secure sites are easily identified by their address beginning with https:/ and some will also be marked by a padlock icon next to the address bar. There are so many options for purchasing – chances are if you look around you can find a secure source for your buy! Apps: That new game everyone is buzzing about is a blast – and free to boot! The options for apps are so endless that we might not consider the source carefully enough before clicking download. Do a little research on the provider of free programs to make sure it is a reputable company; some free apps are also devices for delivering spyware and adware as well (how does this game’s ads know about my craving for pizza last night?!). Emailing: We have all been warned about opening attachments from strangers, nowadays it is best to use precaution with attachments from any source – that could be a photo from your aunt’s vacation or it could be malware from someone who hacked your aunt’s email (she never did get around to updating her password from “qwerty”). If you are not expecting someone to share a file with you via email, it is not unreasonable to send a separate email inquiring about its validity. The same needs to be applied to emails from reputable sites asking you to confirm personal information; Netflix, Paypal, and eBay are common targets for phishing scams. If you receive a request that is concerning, call their customer service department instead: most companies will not request personal information in this manner. Passwords: Speaking of your aunt, roughly 55% of Internet users have the same password for most, if not all, websites. And though we love our pet so much, his name is not the best option for a password; especially since he is all over your social media. We are all guilty of trying to make logging in as easy as possible and have heard the warnings and suggestions on alpha-numeric and special characters. So, if you need one more piece of encouragement to change things up: according to the Bureau of Justice Statistics, identity theft cost Americans at least $15.4 billion in 2014 alone. Keep your accounts safe, use an external source for storing your passwords, and if you need some inspiration you can use a password generator to help you increase security. And if you’re looking for a position in the internet security world, check out our open positions, here.